Claude Rodrigue was born in April 1930 in Cairo and came to England in 1947. He read mechanical engineering at the University of London, and became a photographer, and subsequently a stockbroker. He made his international debut at the 1956 European Championships in Stockholm, representing Egypt. He was the World Par Champion in 1960. Now representing Great Britain, he won his only European Championship in 1961 in Torquay, in partnership with Kenneth Konstam. His longest international partnership was with Tony Priday, with whom he won a Silver Medal in the 1971 European Championships in Athens. In all he played in ten European Championships, three Olympiads and one Bermuda Bowl. 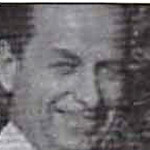 He won the Sunday Times Pairs in 1967 in partnership with Louis Tarlo, and was the only player to appear in all seventeen stagings of the Sunday Times Pairs in its original form. He was a Gold Cup winner four times, and also won Crockfords and the Portland Pairs, the latter in partnership with Fritzi Gordon, but in his heyday he was always more a rubber bridge player than a tournament player.